While the default RT color scheme nicely matches the Best Practical colors, you may want to personalize your RT instance to make it better fit with your company colors. The fundamental look of RT comes from the selected theme. Different RT versions have a default, and the RT admin can set the system-wide theme with the $WebDefaultStylesheet configuration value in the RT_SiteConfig.pm file. If you have granted the ModifySelf right to users on your system, they can pick a different theme for themselves by going to Logged in as -> Settings -> Preferences and selecting a different theme. RT has some built-in controls to manage the look of the theme you select. To use the Theme Editor, log in as a SuperUser (like root), and navigate to Admin -> Tools -> Theme. From there you can upload a logo and pick colors for the various page sections. RT will automatically pick out the six most frequent primary colors from your logo and offer them as options next to the color wheel. In less than a minute, you can upload a logo and set a few colors. Until you click "Save", color changes are temporary and are only shown to you. When you find the color scheme you want, click Save to make it the new theme for the entire RT instance. If you ever want to wipe the slate clean, you can use one or both of the "Reset to default" buttons. The theme editor lets you do a bit more if you know your way around CSS or have a web designer who does. By writing your own styles in the Custom CSS box, you can quickly customize the RT look and feel pretty extensively. The primary RT elements are stubbed out for you in the edit box. After making CSS changes, click Try to see how they look, and click Save when you're done. If you're more ambitious and good at CSS, you can go even further and create your own theme. As with all modifications to RT, it's a bad idea to just change the CSS for one of the standard RT themes in place. When you upgrade, if you protect your modifications from being over-written, you may miss out on updates that are required for new features. In the worst case, an upgrade might wipe out all of your changes. 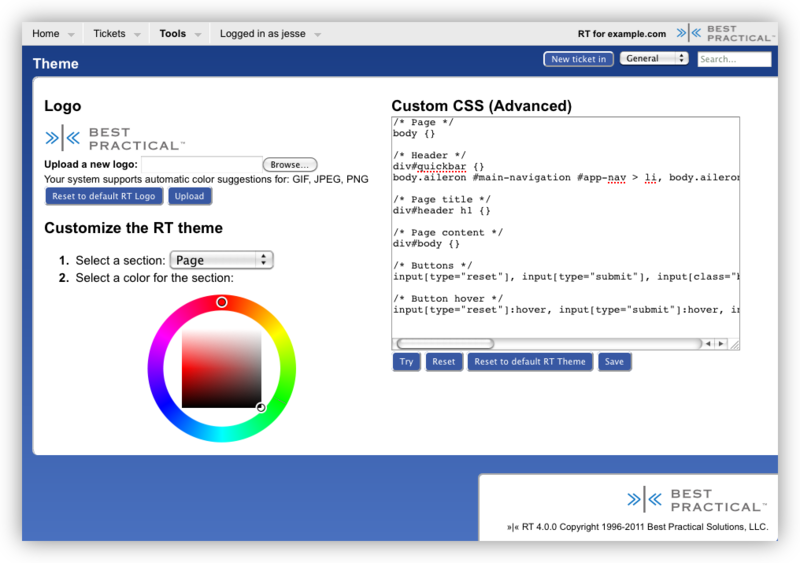 Below are a few approaches to customizing RT's CSS. CSS added this way is included across all themes. If you are writing an extension, see "AddStyleSheets" in RT for how to simply and programmatically add values to @CSSFiles. The above approaches work well if you need to change the look of part of RT, but you may want to design your own RT theme and leave the standard RT themes available to users unmodified. In this case, you'll want to create your own CSS directory. You can call your "localstyle" directory whatever you want and you don't have to copy the rudder theme to start from, but it's a good place to start off for RT4. If you restart your RT it should look just the same (assuming you copied your current default theme), but if you go to your Preferences page you'll see that the system default theme is now your new "localtheme." If you look at the CSS being loaded, you'll also see that the main css file is now being loaded from your local directory. But you'll also see that files are still being loaded from the main RT css directories as well. Why? The place to start understanding the loading order of RT's CSS is the main.css file. You'll see it first loads ..base/main.css which are the base styles for RT along with styles for other tools RT uses like jQuery. After loading all of the base styles, main.css then imports a theme-specific version with overrides and new style elements for the selected theme. So as long as you follow the CSS precedence rules and use the correct specificity, you get the last chance to modify things. You can start modifying things by editing the CSS files in your new localstyle directory. When you upgrade RT, you'll want to look specifically at any changes to the style you started from to see if there are any new styles you want to merge into your new style.